The Legends have travelled everywhere from Feudal Japan to the American Civil War. But this was the first time we have seen them return to an old stomping ground. This episode works as a direct sequel to the season 1 episode, The Magnificent Eight, with Jonathan Schaech returning as Jonah Hex to help our heroes battle a band of merry outlaws. The resulting episode is entertaining but it did suffer from the same problems that come with sequels and the novelty of the wild-west had unfortunately diminished. The Magnificent Eight was a straight forward homage to the classic Western, hence the title. Outlaw Country doesn't attempt to follow up with a tribute to a classic movie and this is probably just as well. There is enough fun to be had in seeing characters poking fun at the common Western movie tropes. This episode focuses on Hex trying to square off against his archenemy Quentin Turnbull, played by Jeff Fahey. This allows us to go deeper into Hex's past and explains his tragic facial scars to the audience. It also allows Schaech to stretch his acing muscles, allowing him to become something more than just a grizzly badass. He really delivers a solid performance during his many conversations with Caity Lotz, even with his facial prosthetics making him slur his lines slightly! Turnbull doesn't really fare very well. He was an entertaining villain and actor, Jeff Fahey, gives a lot of energy to his performance and manages to come off as one of the more colourful villains the show has created, this side of Damian Darhk. But his character was lacking in the villainy department as there wasn't enough of an aura of danger surrounding him. He certainly isn't someone you would expect to have a history with someone like Hex. But he hates Hex just as much as Hex hates him. But I just wasn't invested in their rivalry and the writers should have done something more in that regard. And this episode isn't overly important to the whole plot of the season as it mostly serves as a way of pairing off various characters to build up their relationships. Sara has really been stepping up in the absence of Rip and but's heads with Hex who doesn't like the idea of taking orders from a woman. But this was a brilliant way of establishing her position as leader of the motley crew. Her conflict with Hex does seem a little hypocritical though, as she complains about his screwing up her plans, when her need for revenge against Darhk had screwed up plenty of plans in the past. 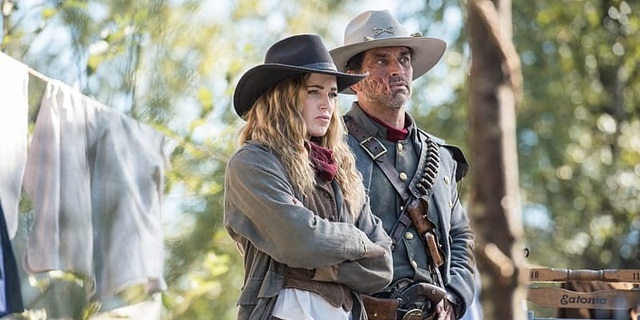 This episode was particularly good for Nate, played by the very handsome, Nick Zano, whose optimism becomes even more pronounced when he is given the opportunity to play cowboy. Nate and Ray get to have a lot of fun with Ray being the 'Been There, Done That' character in this episode. We also see the pair bonding as well as Ray telling us that we don't need powers to be a hero. It is nice in the end though that Nate finally gets a suit and while it has been fun seeing Ray adjusting to life without his ATOM suit, I'm interested to see how his life is going to have adjust again, now he has enough Dwarf Star to build a new one, this is something which will probably be focused on in the Invasion crossover.